The worst problem you can have with a tea steeper – apart from winding up with one that has overly large holes which allow tea to escape into your cup – is having a metal steeper that is prone to rusting after use. You won’t have this problem with these Steepware Tuffy Tea Steepers. These steepers are made of silicone, so they are durable, flexible and rustproof. 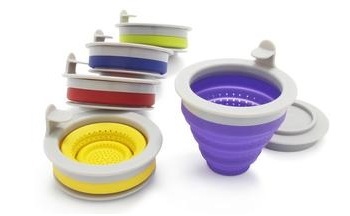 They have a plastic frame that gives them their shape and allows them to sit on the rim of a mug, but the silicone cones of the steepers have a unique collapsible design so that they can fold up flat when not in use. This makes for easy and convenient storage – not that tea steepers typically take up a huge amount of cupboard space, but a flat kitchen gadget always fits in better than a bulbous one!